"In an era of declining budgets and adversaries’ evolving capabilities, quick, affordable, and routine access to space is increasingly critical for national and economic security," reads a Defense Advanced Research Projects Agency press release. To that end, the agency has requested over $80 million for its XS-1 spaceplane program. The unmanned craft will include a reusable booster than can deliver expendable upper stage compartments into orbit. Phase 1 of the project awarded contracts to six private companies to develop the craft. Boeing and Blue Origin, Masten Space Systems and XCOR Aerospace, and Northrop Grumman and Virgin Galactic all received funding to "evaluate technical feasibility and methods." The project has now entered stage two, which includes the final design and testing of a prototype. Ultimately, DARPA hopes to achieve four technical goals. 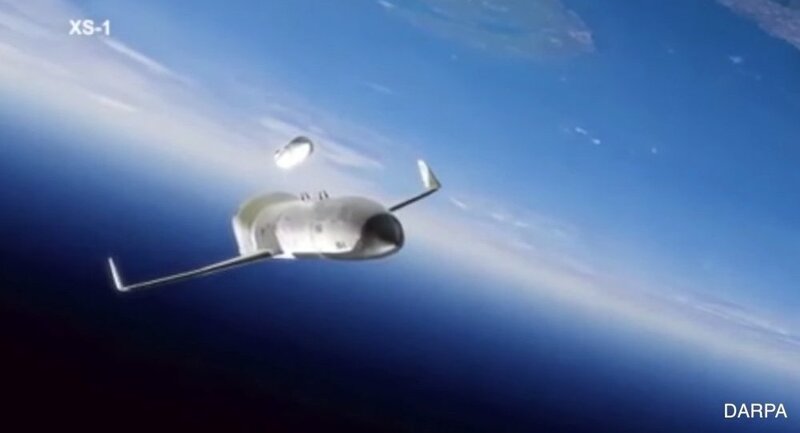 The spaceplane must be able to fly 10 times during a 10-day period, enter space in an airplane-like capacity, achieve a high flight velocity, deliver a 900-pound payload, and do so for under $5 million per flight. Once perfected, the XS-1 would be able to place satellites in orbit or deliver supplies to the International Space Station. The XS-1 program is DARPA’s latest plan to more affordably launch satellites. Last year, the agency abandoned plans to launch a space payload from the belly of an F-15 fighter jet. Developing a specialized rocket fuel known as NA-7, the agency hoped that small pods could be launched from the aircraft once it had achieved peak altitude. Unfortunately, the rocket fuel proved highly explosive. "From a performance standpoint it’s still great but from a safety standpoint you have to work that out," Brad Tousley of DARPA told Space News in December 2015. "As of the present, we’ve stopped planning for any launches." If the Pentagon implements a low-cost orbital vehicle, it would help pave the way for commercial space exploration. In February, Virgin Galactic unveiled its SpaceShip Two, a two-pilot, six-passenger plane that will send customers beyond Earth’s atmosphere for $250,000 per ticket. Currently more than 700 people have reserved a seat.